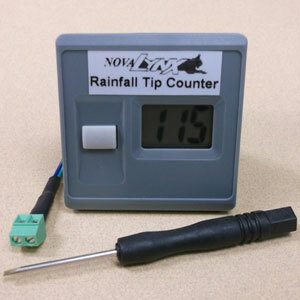 The 260-2598 Pocket-Size Digital Event Counter is a low cost solution for counting tips when calibrating a tipping bucket rain gauge. This compact counter has a reset button on the display face and mounting clip on the back. The liquid crystal display is visible even in bright sunlight. The 260-2598 Pocket-Size Digital Event Counter is a low cost solution for counting tips when calibrating a tipping bucket rain gauge. This compact counter has a reset button on the display face and mounting clip on the back. The liquid crystal display is visible even in bright sunlight. The unit is self-powered with a 2-wire connection. A small screwdriver is included for making wiring connections to the 2-pin screw terminal. 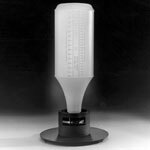 Disconnect the rain gauge from the data logger or other measuring device. Connect the two wires from the rain gauge to the 2-pin terminal strip. Each tip of the rain gauge bucket will increment one count. Push the gray button to reset count. Note: The counter is powered by an alkaline button battery #357 and should last at least a year. To change the battery you will need to locate a one inch slot on either side of the back. If you look into the slot, you will see a pressure tab. Using a flat blade screw driver, place the end of the screwdriver between the edge of the case and the tab. Twist slightly. The case should separate. The battery is located in the silver clip. It will slide out either from the top or the bottom. A replacement battery may be obtained at most drug or hardware stores.